Even though Chelsea were found wanting by Manchester City on Saturday, Guus Hiddink is still able to appreciate their opponents’ qualities. In particular, the legendary Dutch managed has praised Blues old boy Kevin De Bruyne, who he has described as a ‘beautiful player’. “He is very keen on playing in between the lines,” Hiddink told reporters after the match [as per Goal]. 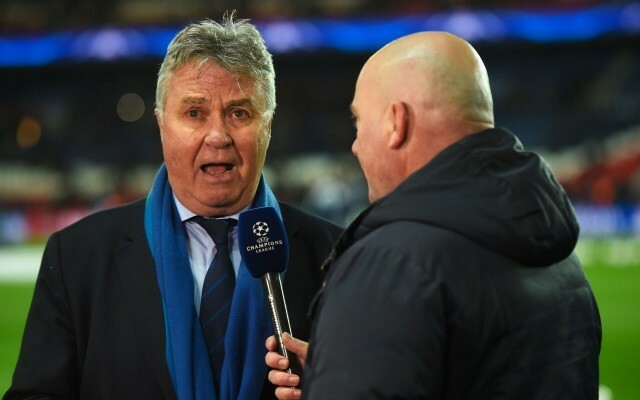 “He was a beautiful player to see,” Hiddink continued. “The difference a bit between us and Man City, they need one and a half chance and then they score one goal. “Unless you play them, it is beautiful to see. It is always easy to give analysis now [on De Bruyne leaving]. Was there competition for three or four players in one position when he was here? Yes. Following on from his decisive contribution against Paris Saint-Germain in the Champions League in midweek, De Bruyne once again impressed upon his return to his former club. While Sergio Aguero stole the show with a hat-trick, De Bruyne—playing in the hole in Manuel Pellegrini’s 4-2-3-1 formation—registering two key passes and managing a pass-accuracy of 88 percent. Intriguingly, De Bruyne could feasibly have been an option for Hiddink had he not been offloaded by Jose Mourinho in 2014. The Belgium international impressed for Wolfsburg, and contributed a whopping 20 assists and 10 goals last term before earning his big-money switch to City. While De Bruyne missed a big portion of this season through injury, he has still shone in the EPL, registering nine assists and scoring six goals during an excellent campaign. He will surely be influential if City are to advance past Real Madrid in the Champions League quarter-finals and win the European Cup for the first time.